The challenge of publishing for the Kindle format is that readers are only exposed to one dimension of the story. 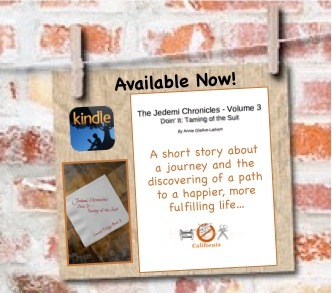 For the Jedemi Chronicles (Launch Trilogy and Series), music plays a huge role. 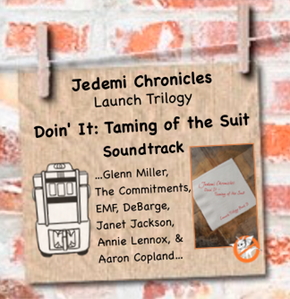 We are about to publish the third book of that trilogy: Doin’ It: Taming of the Suit. The following are songs in the order they appear in the story (along with some context). Enjoy! The JUKEBOX is playing Mr. Pitiful from THE COMMITMENTS soundtrack. > Also from the Commitments soundtrack. Presently, it is playing TREAT HER RIGHT. She is bouncing along, especially to the “Hey, Hey” part, as she prepares her dinner. > Her stereo has now started playing EMF’s UNBELIEVABLE. EMF Unbelievable from 1001videoclips on Vimeo. > music comes on (RHYTHM IS THE DANCER). Rhythm is a Dancer – Snap! > the audio kicks in and RHYTHM OF THE NIGHT starts to play. LYRICS: To the beat of the rhythm of the night, dance until the morning light. > The opening pledge of RHYTHM NATION starts with the screen blank. We are a nation with no geographic boundaries, bound together through our beliefs. We are like-minded individuals, sharing a common vision, pushing towards a world rid of color lines. > …tight shot of the Rhythm Nation dance routine with a slow pullback to a view from right behind Katie. > Annie Lennox’s “Sisters are doin’ it” begins to play. > The shot now is in black & white. It looks a lot like the set of the “Miss You Much” video (chair dance). > To the sound of Copland’s Appalachian Spring (part 2 of 7), we see Katie burst into her house, looks at the clock, starts the coffee and races off into the bathroom. > Katie is zooming into the parking lot. The sounds of “Sisters are doin’ it for Themselves” can be heard coming from her Alfa radio. > Closing Credits: The chorus version (Glow) of Sisters are Doin’ It” plays. It is followed by a Karaoke version. Katie (the Suit), who has hit a plateau in her quest for a purposeful existence, has been unexpectedly sent to Europe for a series of business meetings. The consequences of her adventure spur her onto the next level. >> A jukebox found by a café owner at flea market takes on a life of its own. >> The café owner learns more about her jukebox from new arrivals at the café who become regulars and help her avert a near disaster. >> A hard-charging, corporate ladder-climbing young lady (the Suit) has a close encounter at the café that leads to a life changing experience. Empty pockets never held anyone back. Only empty heads and empty hearts can do that. Stories about the spirits of the past who arrive at Jedemi Cafe to enable the creative spirit through the Enchanted Jukebox, napkins and other creative means. Music plays a big role at Jedemi. In the Listening Room you'll fine the Enchanted Jukebox and links to songs that are resonating with cafe regulars and the Spirits from the past.